Sam & Tim’s Sam and Aldworth Manor Wedding in Harrisville, New Hampshire. Videography is often considered an “added” or “extra” expense. At Media Northeast, we think hiring a videographer should at the top of your wedding budget. It is a decision you will not regret. Here are a few things to consider when planning your wedding event. Videographers capture movement and sound. Wedding videos capture movement and sound. With a wedding video, you’ll be able to hear your spouse gasp during your first look, your toasts, and absorb all of your family’s laughter. You’ll be able to watch your first kiss as newlyweds, your first dance, and maybe even your grandmother’s amazing dance moves. Wedding videos capture the emotions of the wedding day. 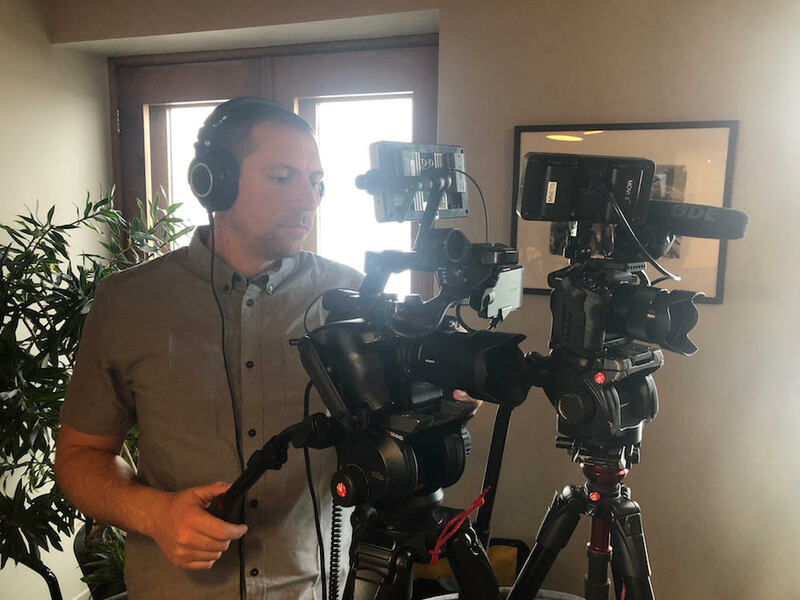 It’s great to hire a professional filmmaker who captures the raw footage of your big day but also edits it down to create an emotional movie, often set to music, that will tell the story of your wedding from start to finish. It may be a long or short version, but it will be a piece you can watch over and over to relive your day and those feelings. You miss a lot on your wedding day but the video won’t. Your wedding day will go by very quickly, and unfortunately, you won’t be able to see everything. You won’t see flower girls walk down the aisle. You won’t see your mother-in-law react to your vows. You might not see your parents dancing cheek-to-cheek while you’re mingling with guests. A videographer can capture these moments on film, and allow you to watch them later. Don’t miss a thing. Wedding videos are so very shareable. Nowadays, videographers can upload wedding videos onto platforms such as Instagram, YouTube or Vimeo which allows you to share your wedding video with loved ones. If you have a destination wedding, it lets family and friends who were unable to attend, feel like they were there. You can watch your wedding video again and again. Watching your wedding video, say every year on your anniversary, creates a whole new family tradition for you and your partner to enjoy together. Showing your kids later (if you have them.) will be amazing too. When we first got engaged our parents told us their one regret was not having a videographer at their wedding so we knew we needed to have one, and are lucky we had the best!! We found Josh through our Photographer, the moment we watched one of his highlight videos we knew that we had to have him. It also made us feel so much more comfortable knowing that he worked regularly with our other vendors. His work is absolutely amazing, we have watched videos of friend’s weddings we’ve been to and already feel bad that they didn’t have Josh to capture their most important day. We planned a wedding in Maine from afar and Josh was very helpful with everything, he responded immediately to any questions we had. Josh and AJ were able to capture every moment of our big day. The morning of the wedding Josh was prompt and made sure he had plenty of time to use the drone (Yes, I said drone!!) Throughout the day you couldn’t even tell he was there. There was a couple times where he pulled us aside to get shots again making sure that he had all the material he would need for editing. He was very professional and personable. I cannot recommend him enough, his work is amazing and he allowed us to enjoy our special day without having to worry about if he was getting all the shots. He made us so comfortable and I am so happy with our choice! The quality of his work is superb. Thank you so much Josh!! We were on the fence about whether we needed a wedding video or not and for those of you thinking the same thing; do it! We cannot say enough good things about Media Northeast. Josh was amazing to work with; so attentive and professional we felt so comfortable with him the day of. Our wedding video came out absolutely perfect. There were so many moments captured that we were too busy to notice the day of. We are so happy to be able to look back on these memories and re-live our special day. Their artistic style is unbeatable. We would HIGHLY recommend Media Northeast. To check our availability for your wedding date, please contact us. We’re always happy to talk with you.